Knit Bob Purl :: Probably more knitting. Probably less penguins. I ended up having a conversation during a working row of the laminaria the other night. A stupid stupid conversation that left me with one extra stitch by the time I got to the end of the row. After hours and hours of trying to recover from it (whatever it was that I did wrong – I can’t tell at the moment), and tinking back to the halfway point I am conceding defeat and will rip back to my last save point. I am quite gutted. I would actually like to walk away from it for a while, but if I want to meet my birthday deadline, I need to keep going. This is only the first repeat of the blossom chart, so there is a long way to go yet. I do have a hat and fingerless mittens that are a long overdue project for a friend. The hat is the most important, but the mittens will be a more interesting knit. And the yarn is worsted weight, so it will be quick too. I am also making another pair of the cabled slippers for my dad. I am stalling somewhat on it though, as the yarn is vile to knit with and I don’t like knitting the same pattern twice. It would be good to be able to send them back with our current visitor, but I somehow doubt that they will be finished by then. In other news, I am going for another MRI tomorrow – this time of my nerves. Hopefully they will find whatever is causing all this pain and it is easy to fix. This means that I need to spend time tonight taking all my piercings out *again*. But on the the other hand, it means another trip to Body Manipulations tomorrow to get them all put back in again and maybe have something else put in. Everything has it’s up side, I suppose. If you are going to put down a relatively complicated lace project (Laminaria) for a while it would help if you kept your notes up to date so that when you pick it up again you don’t have to spend over half an hour trying to work out where you are. Sewing down the picot edging on the Biological Clock socks is turning into a complete nightmare. Not fun, pleasurable or any of the things that I love about knitting. I am either going to tear my hair out over this or work out a a way of doing this less painfully. What is involved with a sewn picot bind off is a row of *k2tog yo* at the point where the top edge is going to be, and then a few more rows of knitting to make what will be the hem. As I am binding off the cuff of a sock, my hemmed section is ribbed, but I assume that in other cases it may be plain stockinette. For my first attempts, I put the live stitches onto waste yarn and tried sewing it down from there, but it was difficult finding the live stitches because they dropped down, dragging the waste yarn with. Pulling one stitch up would drop it’s neighbour and it was just really frustrating. I ended up putting the stitches back on the needle in the hope that it would be easier. Another thing that was frustrating was that I couldn’t seem to sew the stitches down in a straight line. Because I was tightening the stitches as I went along, it was difficult to see which row of purl bumps I was supposed to be picking up. This continued to be the case with the live stitches back on the needle. I have unpicked back to the beginning about ten times and I am *so* frustrated at this point. I started sewing down the stitches without tightening them, and it seems to be more successful this way. I am not convinced that this is the easiest way (tightening up the stitches is as much of a pain as trying to unpick them) and I think I might try picking up the purl row with a smaller needle and sewing them off together like that. We shall see what happens. It’s been a while, huh. Yoz’s suspected salmonella turned out to be a liver abscess that kept him in hospital for almost three weeks. He is slowly on the mend, but it will be a while for him to be back in the office physically (I am sure he will be there in the virtual sense soon). I was glad when I finished them. I should have (oh, it kills me to say it) swatched as they are slightly too snug for my feet and nowhere near big enough for the intended recipient. If I were to use the same yarn next time (and *swallow* don’t swatch – there’s no guarantee that I will learn from my mistakes) I would use a 3 or even a 4 (US) needle. Although the fabric feels cushy and nice on my feet, I think that at the right gauge it would be sproingy. I shall probably keep these for myself unless I find someone with narrow feet who would like them. Next up in the Sock Madness lineup is the Something’s Shady pattern. It is designed for dyeing, but as I wanted to use up stash yarn for the competition, I chose a turquoise yarn by Cherry Tree Hill that I bought with a specific friend in mind. The pattern calls for an afterthought heel, with waste yarn knit in as a placeholder, so that it is easy to dip dye. Even though I am not going to dye this pair, I decided to knit the pattern as written as it is a new technique for me. Part of my motivation to join Sock Madness was to push the boundaries of my (knitting) knowledge and experience. So I couldn’t pass up the opportunity to do something I haven’t tried before, even if it does scare the hell out of me. 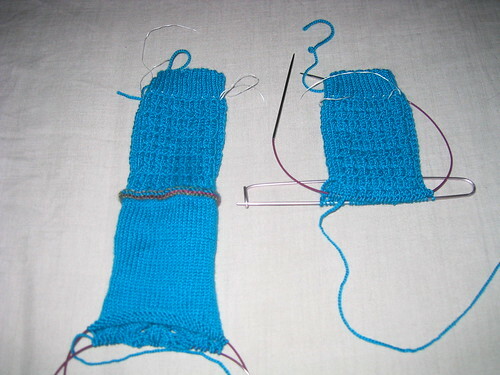 Here you can see the placeholder for the heel and the sole in progress. These socks were just too demanding of my concentration and attention whilst Yoz was in hospital, and they were on hold for a while but I have picked them up and will be coming to the toe on the first sock soon. Months ago I was browsing sock patterns when I came across Rivendell by Janel Laidman. I fell in love with the pattern, and decided that instead of buying and casting on for it *that instant*, I would pre-order her book. I was convinced that anyone who could design something that grabbed me so hard would be likely to have other patterns that I would love too. And I wasn’t wrong. The Eclectic Sole is a beautiful book filled from cover to cover with sock patterns that I want to knit. 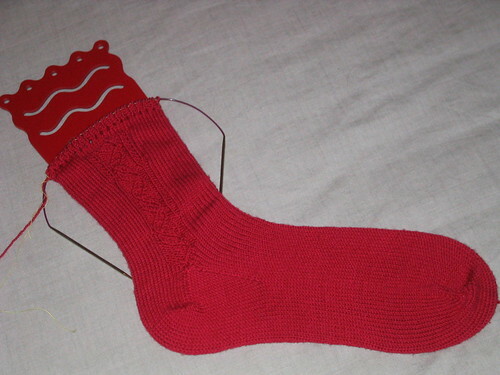 The sock above is the Biological Clock pattern – hitting both my science/geek and knitting buttons. It has been a really interesting knit so far. To begin with it is toe up (my preferred method of sock knitting) and plain stockinette for the foot. This was great for me as I cast it on at a time when the chart reading of Something’s Shady was just too much for me to cope with. Things got interesting at the heel as it is a heel flap construction, which is something I have never done from the toe up. And then the double helix chart to die for where I was practising chart reading (I am an old hand now!) and cabling without a cable needle. I ended up making one mistake (a left cross instead of a right cross), and although I would like to drop the stitch back and fix it, I am scared to because of all the cabling. I have a feeling I would screw up more than I would fix, so I have left it in there. The other option would be to tink back, but by the time I noticed it, that would have been an evening’s work on it’s own. Another lesson learned – if I am going to be upset if there are mistakes, use a lifeline! It is on hold for a little bit as the pattern calls for a picot edging where the end is sewn down. I was a little apprehensive about it (I can’t sew, don’t like it and therefore don’t do a very good job. Or should that be I don’t do a very good job and therefore don’t like it. Either way, sewing and me don’t mix), but decided just to push on and do it anyway. I transferred one needle’s worth of stitches to waste yarn (dental floss) and… made a complete mess of it. I have only sewn down a handful of stitches, but it looks awful. This beautiful pattern should not be finished of in such a crappy fashion. I was hoping to spend some time googleing the technique, but lo and behold, today Lime & Violet linked to an excellent tutorial for this exact technique. I will be sitting down with both sock and computer tomorrow to see if I can figure it out. 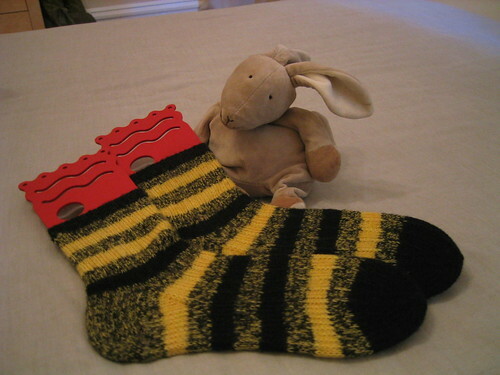 The last knitterly report is of a pair of slippers I made for my poorly husband when he came out of hospital. They are knit flat with three strands of worsted yarn held together and then sewn up (see above for my feelings about sewing). I used fluffy, almost novelty, brown yarn that I had in my stash. I had knit with it once before and after I cast on remembered what I didn’t like about it. It is difficult to see the stitches and just plain not nice to knit with. The pattern is really simple with a cable down each side for decoration. The first slipper knit up really quickly and the yarn masked my shoddy sewing job. It was only as I was sewing up the second slipper that a friend politely pointed out that the first slipper was at least a couple of inches shorter than the one I was working on. I didn’t have enough yarn left to knit a whole new slipper which was my preferred option due to the characteristics of the yarn. Undoing my sewing took an extremely long time – it was impossible to see what was going on, and picking the stitches back up was equally difficult. The yarn kept getting caught on itself and I couldn’t tell which bit I should tug on. It was very frustrating. A three hour project took days. 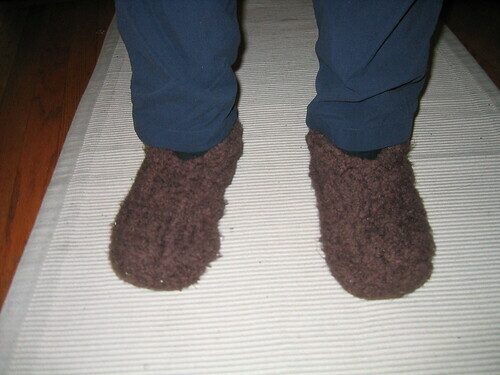 But he did end up with fluffy brown slippers. If I make this pattern again, and that may be sooner rather than later as my father has asked for a pair in orange, I would mirror the cables down the feet. I also wonder if I could knit it in the round to save on all that sewing up. That may be an experiment for another day.